I find that game plans and checklists make for a much happier and relaxed mind. 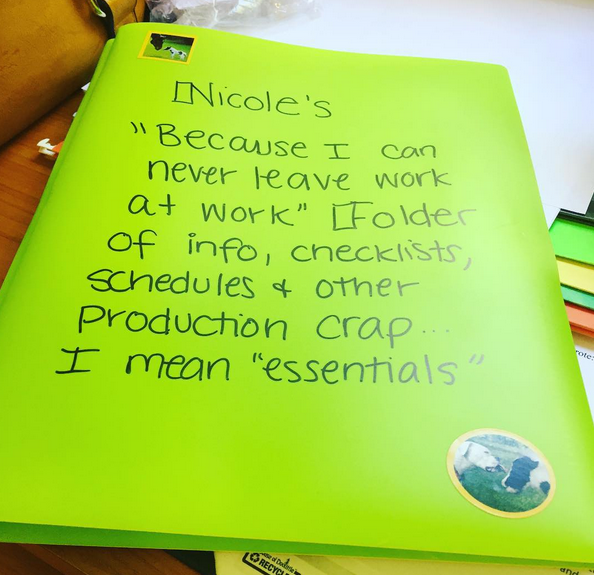 During the workweek I juggle schedules for myself, other departments, producers, budgets, writing, travel, hiring crews, research… the list goes on and on. 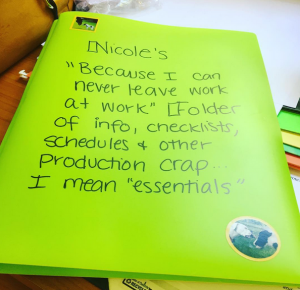 Because you know… Production Life. My team has that â€œnot enough time in the dayâ€ feeling A LOT! Coming from my last job, this new position is a cakewalk though. The difference is, my last job I brought home all of my stress and emotions from incredibly long hours and difficult people, this one, I bring home some physical work. Honestly, Iâ€™m a hard-worker and Iâ€™d rather get things done instead of pushing them off, so I have no problem bringing home some unfinished tasks. Most people would agree that you are paid to get a job done and you should, whether youâ€™re in the office or not. BUT, brining home work related stress and drama is not ok. They say you should never bring your personal life into the office, so why should you bring your office life home? Weâ€™re all going to be stressed at some point, have to work with people we donâ€™t get along with and unfortunately there is no magical force field that keeps all those feelings in your office. Donâ€™t you wish as soon as you got into your car, you mind would just block work from your head until you got back to the office the next day? Iâ€™m sure it would be nice if it did the same for your personal life at work. I understand that this is easier said than done, but itâ€™s something we need to learn to do. At the end of the day, your life is your life and it is meant to be lived! Work is there so you can live comfortably, so donâ€™t let it infiltrate a happy home but worrying about it or thinking about it all the time. Learning to separate your two lives will keep your mind happy. My suggestions are, before you leave work, make a checklist of things to do and whatever emotional stress you hold, tell yourself that youâ€™re leaving it in the office. â€œI will not bring home _________ with me. It is not part of my life. I will take care of it tomorrow.â€ This is the process of letting something go. I canâ€™t tell you how many times a day I say, â€œLet it goâ€ to myself. It really helps. If you get home and your mind is still a flurry of thoughts about your day, put on your favorite music, turn on your essential oils diffuser, and take a hot shower… you may have to consciously change your own thought process. You are home. This is where your life happens. Nothing else matters.